Which Potato Chips Are Healthiest? We aren't here to debate how the potato chip came to be, but instead to compare its evolution into healthier options. With the average American eating close to 5 pounds of potato chips each year and almost 1.2 billion pounds as a nation, studies reveal that Canadians may not be that far behind. There are two important factors to remember when purchasing "healthier" products. This popular snack is said to date back more than 150 years! Potato chips were first created by Chef George Crum, who was trying to teach a picky patron a lesson after they sent back their fried potatoes complaining they were too thick and bland. Contrary to Chef Crum's intention of sassing the patron with his ironic version of the dish, the patron loved the thinly fried potato slices. So the first potato chip recipe was added to the menu under the name "Saratoga Chips" in honor of the location of the restaurant in Saratoga Springs, NY. As with most ingenious creations there are endless opinions about how the potato chip first came to be. We aren't here to debate its creation, but instead to compare its evolution into healthier options. With the average American eating close to 5 pounds of potato chips each year and almost 1.2 billion pounds as a nation. Studies reveal that Canadian may not be that far behind. Changing trends in food including a focus on wellness and healthier options has led to an insurgence of healthier chip alternatives. 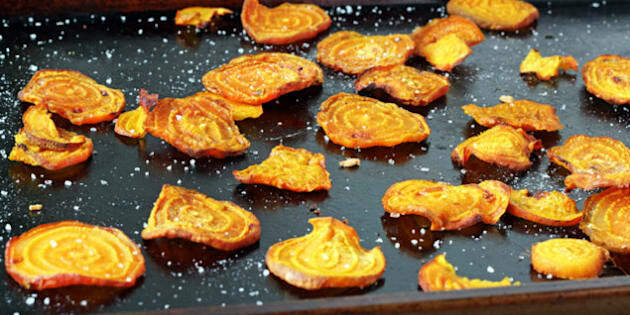 While these are all still considered "snack" items and should be consumed in moderation, they are a fantastic alternative to traditional full fat fried chips. There are two important factors to remember when purchasing "healthier" products. First, check the ingredient list. The list of ingredients should be short and contain ingredients you'd expect including a vegetable, oil and maybe salt. Next up, sodium. While some chips market themselves as a lower fat alternative, many of these brands are packed with sodium to make up for the lack of flavour. Always read the label and aim for a chip with less than 100mg of sodium per serving. Salty snacks not cutting it for you? Not to worry. Chips come in all sorts of flavour combinations including fruit varieties. Choosing chips made from apples is a fantastic way to enjoy a crunchy treat without added fat and calories. Always check the label to ensure that your product is made from simple ingredients with a sugar level that does not exceed 10 grams per serving. After all, we're talking healthy. If your particular chip brand is over 20 grams of sugar you might as well eat a Snickers.